Well, I admit it is not exactly 5 minutes you need to prepare the salad. The actual preparation time for the salad needs only 5 minutes. But, the salad contains beetroot, which needs to be cooked prior to it. Good news – once the water cooks you can leave the beetroot in it to cook on small heat for a long while without supervision (ca. 1 hour). Also, the salad contains potatoes which need to be cooked in an equal manner (ca. 30 min). You can cook the two in the same pot. And this is how it goes: Pick potatoes with a purple skin (ca. 200g) and ca. 350g yellow beetroot or pink-white patterned beetroot (in the picture you can find the later). 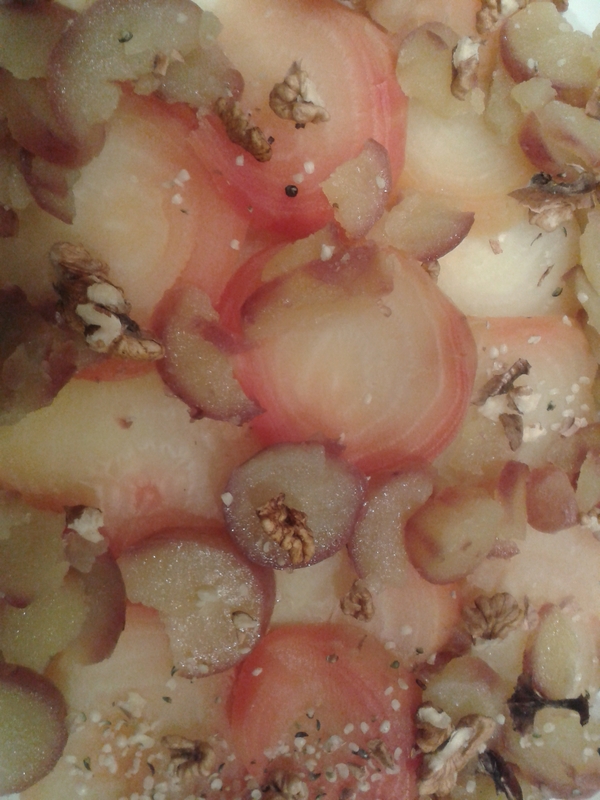 Both yellow and pink-white patterned beetroot are sweeter than standard red beetroot. Once cooked, peel the beetroot and potato. Cut them into disks and arange the disks on a flat plate for serving. Crack 10 walnuts and cut the nuts to small pieces (as small as you want). Add 2-3 spoons of peeled hemp seeds to the walnuts and spread them over the disks. Spread some olive oil, lemon juice and salt over the salad. Voila! It has both very attractive looks and is very appealing taste-wise. Plus, it contains lots of protein and all essential amino acids. It is a full meal for 2-3 people and you don’t need eat more afterwards – believe me!